What stands out immediately is what a cost-effective campaign Reform Party ran. We only spent $0.14 per voter in Ang Mo Kio and $0.19 per voter in West Coast. 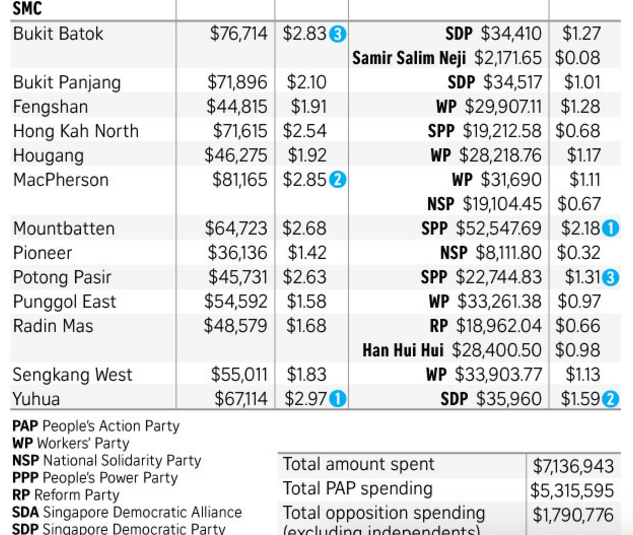 By contrast the PAP spent over 10 times as much as us in Ang Mo Kio and just under 10 times as much in West Coast. 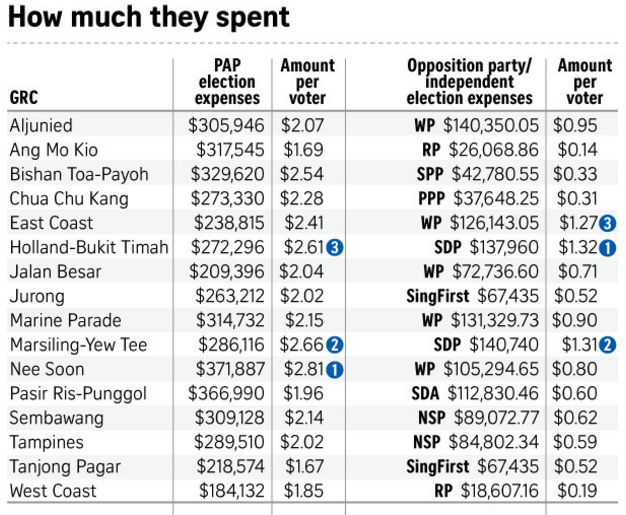 In addition NSP spent over three times as much as us per voter and so did Singaporeans First. If we control for the higher levels of spending and the longevity of the parties’ brands then we clearly performed the best. Even in the three-cornered fight in Radin Mas a supposedly “independent” but in reality Socialist Front candidate who played the race card, broke several election laws and outspent us by almost 50% on a per-voter basis was beaten into second place by our candidate who had a much smaller social media footprint. In addition she lost her deposit. By demonstrating how efficiently we can run an election campaign, we have also demonstrated that we are likely to be by far and away the most efficient party at running a town council. Singaporeans can be confident that there will be no cronyism or inflated costs if we are managing things and that the cost savings will be fully passed on to the residents in the form of lower S&CC or higher expenditure on amenities. The other lesson is how big a role money plays in Singapore’s election campaigns. Despite already tilting the playing field hugely in their favour by having absolute control of the media and the election process, the PAP still found it necessary to spend nearly three times as much as all the other parties put together. Interestingly SDP spent almost as much as WP despite only fielding 11 candidates to WP’s 28 and over six times what we spent for the same number of candidates. If we would be efficient town council managers we would be even more efficient at running the government and controlling waste and unnecessary expenditure while maximising spending on Singaporeans and keeping taxes low. This is the real lesson to be drawn here. Typical response of a sore loser. You spent the least not by choice but because you could not raise enough dollars for your campaign. No one, I guess supported your cause. Go reflect on your flaws and that of your party instead of coming up with stupid articles like that. There isn’t a silver lining in RP’s loss. You are nothing like your father, a disgrace to his name, in fact. Someone who doesn’t like what is staring him in the face. I obviously came too close to the truth with my analysis. As for comparing me with my father perhaps he should start closer to home. I wasn’t born with a platinum spoon in my mouth.